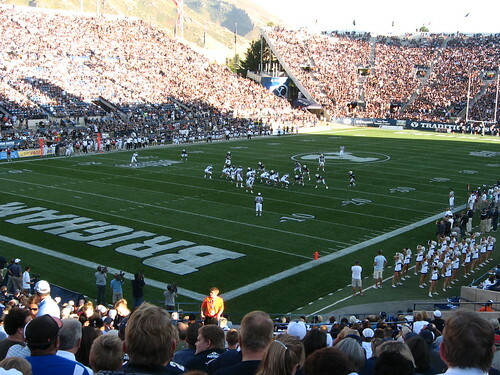 BYU’s defeat last week means one thing for Provo’s Mayor John Curtis: he’ll be bicycling from Provo to Salt Lake as a part of the annual Rivalry Ride tradition. Historically, the mayor from the defeated city must ride from his own city hall to the winning team’s city hall. This year’s ride will be on May 13, 2011, in warmer spring-time conditions. Take a look at UtahRivalryRide.com or ABC 4 for more information. The Rivalry Ride goes hand-in-hand with the annual food drive competition, in which both cities compete to see who can donate the most food for charity. 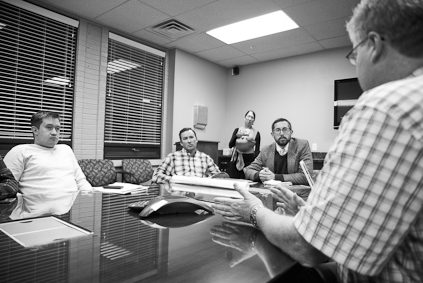 Yesterdays Bike Provo meeting was, as always, productive. We talked about how in a year or so we will be able to apply for a huge grant. This photo shows us talking about that grant. The neighborhood meetings will be a good way to get in touch with the people who are most involved with their local neighborhoods. If we can explain to the attendees of those meetings what the Bike Committee is trying to do (and why we’re trying to do it) then our reach will be that much longer. And a new cycling dawn will be ushered in that much sooner. Off the record, Zac and I may or may not have discussed some sort of modern bike skyway. The future baby, it’s gonna be bright and filled antenna and floating rings around those antenna. The Wednesday night riders are riding again tonight, but a bit earlier. Meet in the north parking lot of the Provo City Library at 8:30 pm. Also, this ride has a destination: the dollar theater to watch Toy Story 3. Join some fellow bikers and enjoy the clear weather. “In total, the Orem Bicycle and Pedestrian Plan recommends nearly 16 miles of new sidewalk, 12 intersection improvements, 17 miles of new paved shared-use pathways, 56 miles of new bike lanes and 23 miles of new bicycle routes. Orem residents will start seeing the first phase of new bike lanes and paths within the next year. Many leaders and dedicated cyclists worked tirelessly to put this plan in motion. Good job, Orem! Provo Cranksgiving is Here Again. If you have not done the Cranksgiving before you are in for a ton of fun. 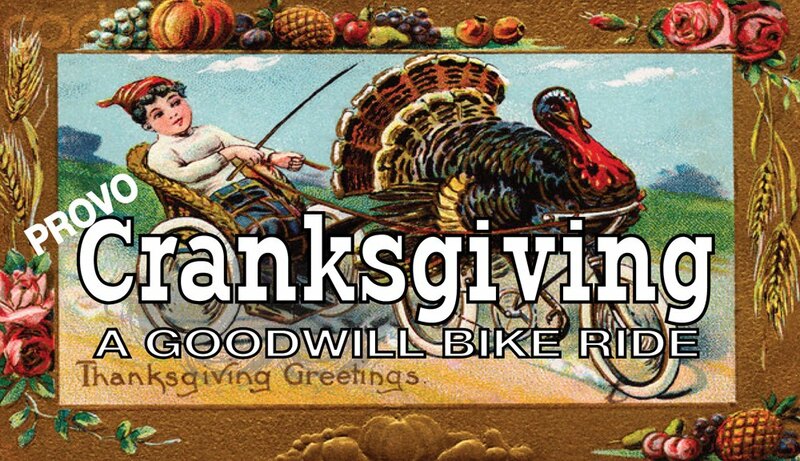 Cranksgiving is a celebration of bicycles and charity. The idea is you ride your bicycle around to a few grocery stores collect some food or other needed items and then drop everything off at the local food bank. 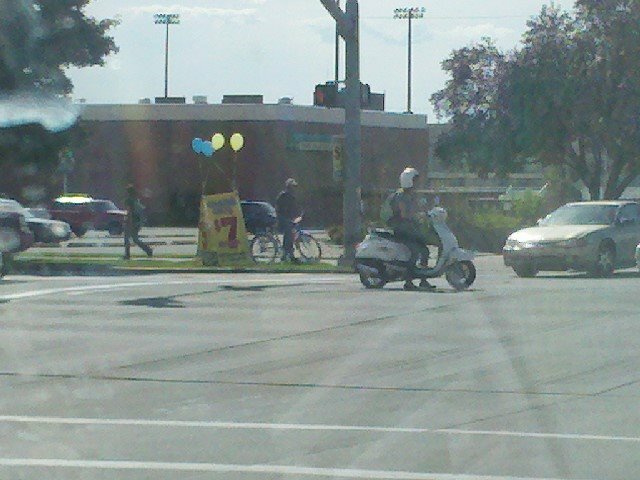 In some places this is a race however here in Provo everyone is invited. The pace is going to be nice and slow so we can all have a good time together. We are not sure about the route just yet. 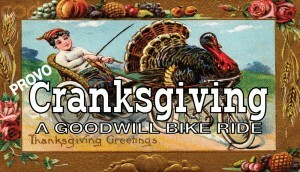 If you keep an eye on provocranksgiving.blogspot.com or the Facebook event they will have updates coming soon. This ride really is a lot of fun and a great way to kick off the Holiday season by helping needy families in our own backyard. You can see how others have done their rides by clicking here. New Bike Lanes on 100 South! Have you checked out the new bike lanes on 100 South? Brave the chill and take a little ride from 100 E. to 500 W. The lanes don’t seem to have little bicycle symbols yet, but perhaps those are yet to come? 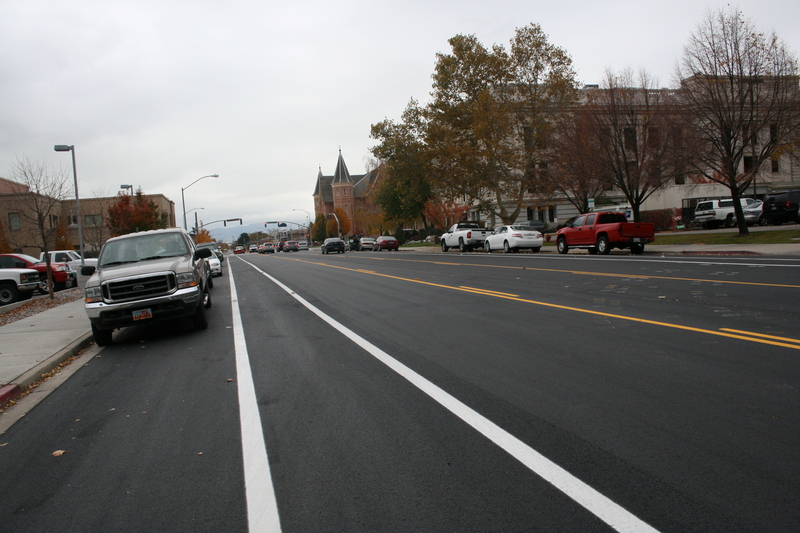 A huge shout out to Provo’s engineering department – thanks for having the foresight to add these bike lanes when repaving the street. They are a great addition and give cyclists a very convenient way to get downtown without having to brave the narrow-lanes-no-sidewalk-riding aspects of Center Street. Support Orem City and Their Bicycle Pedestrian Plan, Tomorrow. Tomorrow is an important day for Orem City and as such is an important day for all of us in Utah Valley, especially Provo. 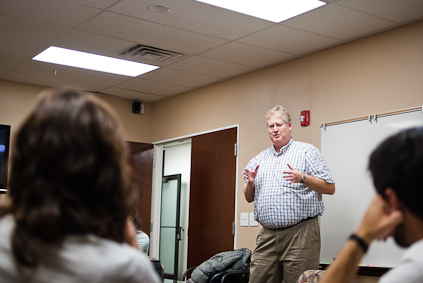 Orem City will be holding a hearing tomorrow to review a Bicycle/Ped. Master Plan that has been in the works officially for over a year. You may be asking, “Why is this important to Provo?” Orem City and Provo City meet on a pretty regular bases, at these meetings the conversation of bicycle and pedestrian infrastructure has been coming up pretty frequently which keeps both cities connected and both cities moving forward on this important issue of mobility and transportation. Showing up to the meeting even if you are not a resident of Orem shows the city that there are a lot of us interested in seeing our communities become better and safer places for all users. BikeProvo will be there to take notes and a few pictures. We hope to see all of you there as well.